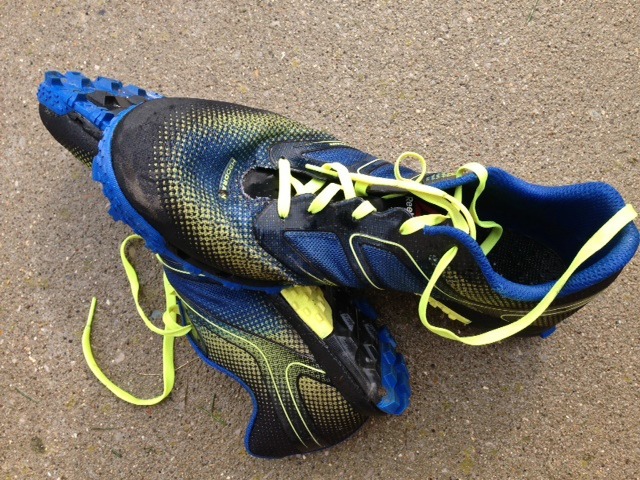 My Reebok Supers have now been battle-tested in 2 pretty difficult races (Indiana Spartan Sprint and Mud Guts & Glory). As promised, I have more to add to my initial reactions. I’ve read virtually every web review and comment about these shoes, so this review will touch upon what have been issues for some. I have not encountered this problem (yet). Although both courses took me through mud and water, I did not have a shoe full of silt when they were over. In fact, I may have had less than with other shoes. Yes. Although to be fair, every other shoe I’ve raced in (Inov8 X-Talon; Inov8 Roclite; Salomon Fellcross; Salomon Fellraiser) except one (Inov8 Trailroc) have been dicey at best on wet hard surfaces. The Inov8 Trailroc is the only one in which I felt semi-secure on wood and wet stone. All the others have more aggressive lugs, so it is to be expected. There’s a bit of trade-off between traction in mud/slop and traction on stone/wood. Maybe it is because I’m accustomed to racing in minimalist shoes, but I have not noticed the Reebok Supers to be any less comfortable than the Inov-8s I have worn. If you are accustomed to running with padded shoes or shoes with thicker foot plates, then expect these to feel a little “hard”. So far so good. I don’t know how many races and miles these shoes can endure, but I don’t have any visible abnormal wear issues yet. The Supers do not have the appearance of a durable shoe, but only time will tell. If I can remember, I will update this page when they destruct. I ran the Miami super spartan and 3x in Tuxedo the past two weekends in the Supers. I ended up getting sand and rocks in the shoes in Miami and rocks in the shoes in the first race in Tuxedo. After the first race in Tuxedo, one of the eyelets on the shoe tore. I ended up sending back to Reebok this week and getting my money back. The shoes drain great and are great for running, but the quality is lacking. I have never had a shoe wear out as fast as these after putting less than 30 miles on them. If I received a free pair I would wear them again, but I just received my new X Talons and will be wearing these the rest of the season. Hopefully Reebok comes out with a modified and improved 2nd generation All Terrain Spartan shoe. I’ve put maybe 60 or so miles on mine and three Spartan races and they have maybe one left in them, the tread has really worn down quickly, and as stated above the amount of rocks and small debris that gets into the shoes in unreal. My wife’s tread is better than mine, but the toe is coming apart and Reebok has been unresponsive to say the least in getting them returned. I’ll be using them for the VA Super this weekend and once I get back I should have my Fellcross 3’s ready for the NJ Super and the Beast.